The 360° Tour is still in everybody's mind and, while waiting for the next tour, we decided to know more about a famous object of this tour: the LED Microphone. We had the chance to interview the creators of this object: 1212-Studio Inc., through Adrienne Gurman and Tommy Voeten. Located in New York City, 1212-Studio Inc., is a custom design, engineering and manufacturing company specializing in the use of LED innovation. They provide custom solutions for lighting designers, video artists, architects, engineers and fabricators. 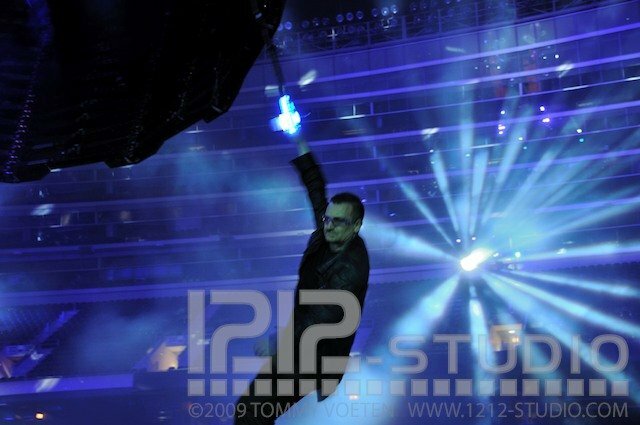 Tommy Voeten, President and Founder of 1212-Studio Inc., became a part of the U2 360° Tour, when he was approached by his longtime colleague, Frederic Opsomer, former Director of Innovative Designs, for a creative solution for an LED fixture to light up the fabric roof covering the now famously colossal stage. 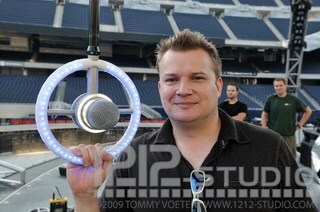 Tommy quickly and successfully designed the U2BE (pronounced you-tube) fixture. Nearly one thousand U2BE's were manufactured, approximately 300 per set (there were three traveling Claw sets for this tour). First of all, had you already worked with U2 before the 360° Tour? If so, when and for which designs? Now we are going to focus on a key item of this great tour, the LED Microphone that was beautifully used on Ultraviolet, Hold me Thrill Me Kiss Me Kill Me and With or without you. Who got the idea of the LED Mic? Your company or U2? When did you start working on the Microphone? In July 2009. After the first leg of the European tour when U2's design team noticed that Bono's face needed to be lit when using the microphone. We received a few renderings and sketches with rough dimensions. 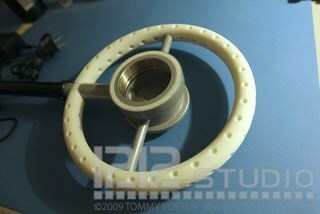 We designed the microphone completely in 3D, using the software program Solidworks. Then the critical parts were rapid prototyped in-house. Bono's microphone, compared to the U2BE fixture, was a much more complicated design and manufacturing challenge because of how it was going to be used on tour. The mic was to be suspended from a steel cable, enabling Bono to swing from it – and to have some fun throwing it around the stage. The 3D Printer from Stratasys, which we use in making prototypes, was instrumental in the development of the final product. Our team was able to print several design versions and sections of the microphone in order to examine and optimize the pressure points and light distribution within the rings and between all the components. The ring design had to be strong enough to hold the pressure of a full body weight without deflecting and crushing the internal components. How long did it take to conceive and manufacture it? Did you do the manufacturing inside the company? If not, who did it? We manufactured all the LED surfaces and the main shell for the ring using rapid prototyping. Also, internal parts were made on our 3D printer. The stainless steel frame was made Innovative Designs, a company in Belgium. Did you face any technical/practical obstacles during the conception? Which ones? 1) Yes, the pressure on the LED's circuit board from weight of performer. Do you have the list of components required for the Mic manufacturing? Yes, but that is something we cannot share. At the beginning of the tour, the Mic was not illuminated, but then it was. Who got the idea of lighting it up? Was it complicated to do? The idea of the microphone came from the band. The lighting part came from the design team of Mark Fisher, Willie Williams and Frederic Opsomer. During the first European leg of the tour, the un-lit microphone was not brightening Bono's face while he sang. Known for his quick-turnaround designs, Tommy was then asked to find a way, using LEDs, to light up Bono's onstage-suspended steel microphone. Tommy got to work and designed a microphone that could produce beautiful, high out-put colors around the ring, using battery powered LEDs. For you, what makes this Mic unique today? The amount of innovation and design integration process combined with the collaboration with the best people in the worldwide industry. Did you get any feedback on this work from fans, the audience, and/or the band? Yes, we received a lot of compliments and positive feedback from members of the design team, such as Catherine Owens and Willie Williams and band member, Adam Clayton. As for Bono, you can see the reaction to the mic on his face. Bono personally thanked Fredric Opsomer and Tommy for the mic in Chicago when he (Bono) used it for the first time at rehearsals in the evening. it was magnificent. (See photos of Bono's first rehearsal with the mic below, photos taken by Mark Fisher). How many mics did you provide on U2's 360 Tour? We originally made 6 mics and have since made 2 new versions. It must be very fragile, especially when we recall how Bono swung with it! Did you have to remake/repair mics during the tour in emergency? In the beginning we had to make small repairs and after a few tweaks, it was very stable; with one exception – the torrential rains in Moscow destroyed the unit and a lot of other equipment. In Version II we didn't have any issues at all – it was rock and roll solid. 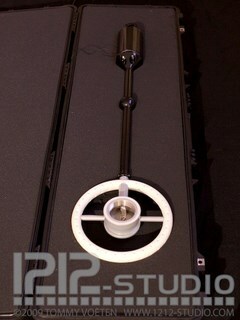 Have you attended one or several show(s) during the 360 Tour to see the mic in action? Or maybe rehearsals? If so, in which cities? When? Yes several rehearsals in EU without the mic and the rest, all in the USA, including Boston, Chicago, DC and New York/New Jersey. What did you feel during the rehearsals (without the mic)? And then seeing the LED mic in the show, I guess you were proud of your work, weren't you? The two songs without the lit microphone felt very dark - there was only Bono's jacket with the lasers and it seemed like something was missing. Also, his face was not lit, except, maybe with a follow spot from afar. 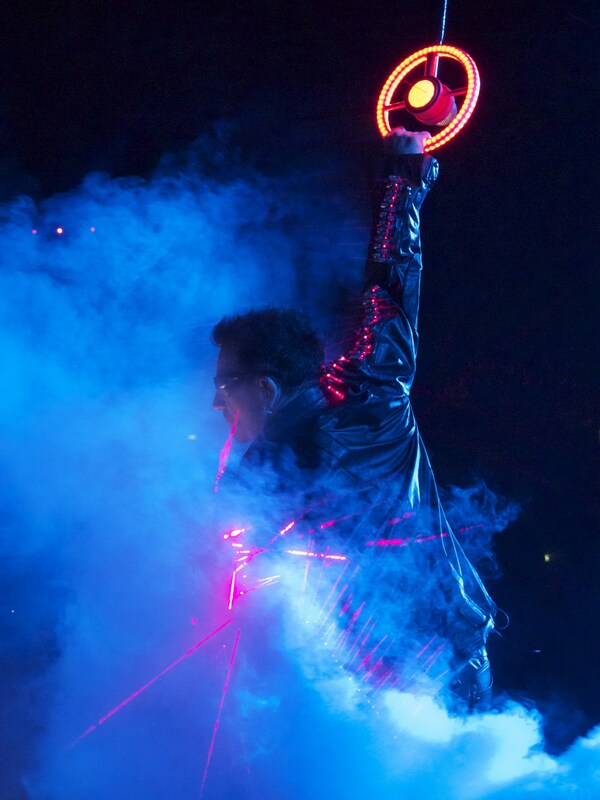 With the LED microphone, everything came together, the white LEDs around the microphone perfectly lit Bono's face. By adding the LED microphone to the show, the total experience became stronger - it both captivated and mesmerized the audience. So, yes, we were and still are very proud of our work and our contribution to the 360 Tour. 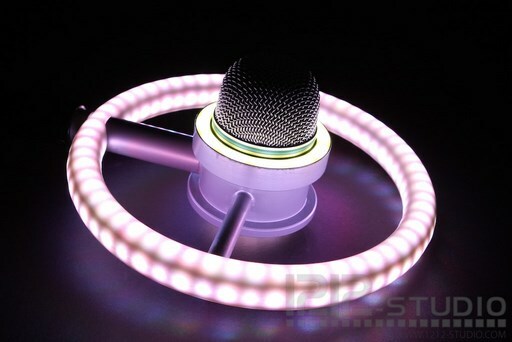 The now iconic LED microphone is something that has become one of the most memorable aspects of this amazing tour. We are honored to be part of U2's incredible history. Have you kept one in your offices? Yes, we have one of the original rapid prototypes in our design studio. 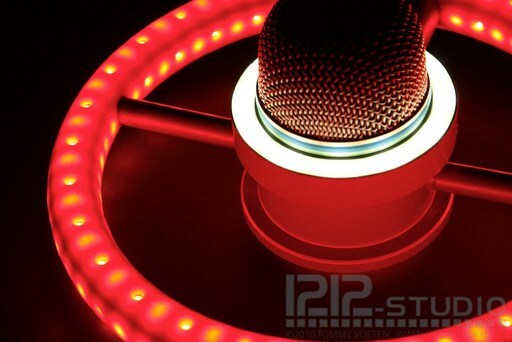 A member of our forum – a specialist of making reproductions (among other things, he made a Baby Claw as a reproduction of the original Claw from the 360 Tour) – is working on a reproduction of the famous LED Mic! Any advice for him? 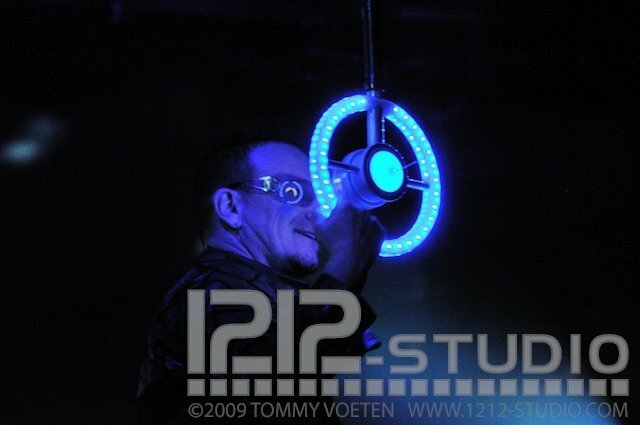 Over 200 LEDs are used in the mic - 12 white (for Bono's face) and 184 red, green and blue LEDs. It's a tedious design process to make everything work and fit. Which other artists/bands have you worked for? We have made custom LED fabrications for several top bands. Please be sure to see the new Metallica movie, Into the Never, where you can see the 12 life-sized LED-lit crosses we designed. We'd like to thank 1212-Studio Inc. for their time and collaboration on this interview. Website of the company: 1212-Studio Inc.